Debuting Sept 24, 2017 on CBS (USA), Space (Canada) and Netflix (other countries). I hope Star Trek: Discovery is great! I honestly do! This series needed a revitalisation ever since Enterprise ended after only four seasons back in 2005. Even though the reboot series of films has kept the series in the public eye, they clearly traded an exploration of science and the human condition for flashy effects, and intense battles. The ‘Kelvin’ universe movies, as they’ve come to be known as, are fun, humorous adventures, but they are not very good at doing what makes Star Trek special. They certainly lost something along the way in the transition into full-fledged action movies and most people I’ve spoken to agree. The reboot films have to be given some slack because it’s impossible to build up and maintain the kind of lore and character comradery that the Star Trek TV series offer when you’re limited to a single story every couple of years. And in today’s environment, it would be much more feasible convincing a movie studio to fund a rollercoaster of an action film would be much more feasible than something more along the lines of “Inner Light,” easily one of the best episodes of Star Trek: The Next Generation — a much more cerebral story where Captain Picard learns of the culture and fate of an alien civilization when a probe makes him live out a lifetime inside his own mind. Star Trek is built on characters and plotlines that build over time that is best suited for a regular episodic format. Someone at CBS must agree because this brings us to the newest member of the Star Trek family, Discovery. This upcoming entry was originally announced in 2015 for a debut in January 2017. It was stated that the show would be part of the Prime Universe (avoiding any connections to the Kelvin universe movies) and that it would take place about a decade before Kirk’s time on the enterprise, presumably meaning the era of the Original 1966 Star Trek series. Discovery would be promoted as the flagship show for CBS All Access, their own video streaming service would be a 13 episode miniseries. This is generally half the length of a season in most high-profile TV series. This, plus a later revelation that Discovery was to follow a central character rather than a traditional ensemble cast, made the series begin to feel like it was going to be a standalone story arc instead of an ongoing series. Not the triumphant return of Star Trek that I had been hoping for, but I was still excited to see the show! Get caught up with Captain Kirk’s final adventures with this blu-ray package from Amazon. In late July 2016, a teaser was released that depicted the launch of the USS Discovery, the ship that the series is named after. It was a highly polished showcase of the ship’s design and it was presented in a scene reminiscent of the launch of the Enterprise in 1978’s Star Trek: The Motion Picture. This was the public’s first look at the visual style of the new show and reactions were extremely mixed. While there were certainly many people who were excited, the reveal of the ship must not have generated the buzz that CBS was hoping for. Within a day or two, it was announced that what was shown wasn’t the finished design and they would keep working on it. At the same time, CBS announced a licensing deal with Netflix that they said paid for the entire series on its own. In the US, while Netflix will distribute Discovery in other regions. September 2016 finally brought some cast related news. They still hadn’t cast the main character. This was obviously not what the fans were hoping for since the premiere date was only about four months away. But this was only the tip of the iceberg as more news came out over the next couple of months that showed production wasn’t only behind schedule, there were creative conflicts as well. In order to meet the quality that would be expected of such a high-profile production, the release of Discovery was pushed back to May and the show was hoped to go into production in November 2016. Meet the cast! Image Copyright Entertainment Weekly. The series was pushed further back in December 2016 with the casting of Sonequa Martin-Green as Michael Burnham, second in command of the USS discovery, and the main character of the show. At the time she was under contract with AMC on another high-profile science fiction series and could not begin filming for Discovery until May 2017. When we moved into 2017, the public continued to be left in the dark about the show. Beyond the occasional casting announcement, there had been no images or footage of substance to give audiences an idea of what the show was going to look like. If this were a new and original property, the trailers might have been better received for their top-tier special effects and makeup work, but when you look at this as a Star Trek project, Discovery seems to be completely ignoring the visual and stylistic language that defines how Star Trek feels in favor of a presentation that is fully embracing the post-Transformers era of movie marketing. If this series is approximately a decade before Kirk’s series, then the Enterprise herself already exists at the point in time when Discovery is set. Captain Christopher Pike, and science officer Spock are already exploring the galaxy. Yet there have yet to be any demonstrations that Discovery is set in that era at all. Of course, we’re going to want higher quality sets and more detail than Gene Roddenberry was able to offer us in the 60’s, but the art direction should demonstrate much more of a connection to that era rather than the Kelvin universe films. 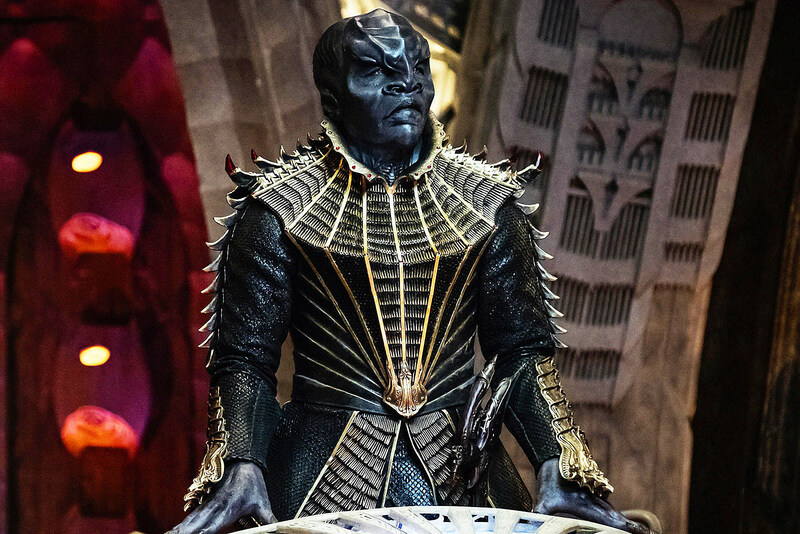 The Klingons, as famous and popular in North America as the Daleks are in the UK, have been the recipients of a massive redesign that is both ignoring what has been established before, while reinventing everything about their appearance. This move is not sitting well with long-time fans of the series and if I am being generous, will say is getting mixed reactions. Another controversial announcement was dropped on the fans in July when it was revealed that Martin-Green’s Human character is the never before mentioned half-sister of Spock himself. Raised on Vulcan by Sarek and Amanda, Spock’s parents. This move isn’t inspiring the fans as everyone remembers the last time our favorite Vulcan was given a surprise relative in Star Trek V: The Final Frontier. It was a critical bomb and ever since has been one of the most heavily mocked projects ever associated with Star Trek that no one in their right mind would want to connect to another Star Trek project. Sadly the unsettling PR continues to mount as CBS has placed an embargo on reviews of Discovery until the day after it airs, and that has historically been seen as a sign that a studio wants a premiere to be unhindered by unfavorable reviews. In the end, with Netflix is effectively financing the show, and a backup series already being worked on by Nick Meyer (Director of two of the more popular classic Star Trek Films), CBS isn’t putting anything at risk other than the integrity of the Star Trek brand, itself. The producers are asking for patience and for the fans to have faith that they have addressed all of these issues in the show itself. They insist that the changes make sense in the context of the story, and despite all of my concerns, I intend to give Discovery an honest chance. I decided to prepare for Discovery with a month-long re-watch of all of the Kirk-era episodes and movies, and amazingly, I found Star Trek V to be redeemable! Of all six of the films, it was the only one that actually felt the most like a big screen adaptation of the original series camp that defined Trek in the 60’s. And if I can find merit in the worst of the films, Discovery may have what it takes to surprise us all. Great article Shawn. I learned a lot!